If you have an unidentified signal that you would like the wiki readers to take a look at please use the form linked below. Include as much information about the signal as you can including frequency, waterfall images, MP3 sound samples, location, bandwidth and anything else you can think of. Please consult the instructions here for more information on adding a signal - Adding An Example Signal. If you happen to be able to identify a signal, please either edit the wiki (See the Adding An Example Signal page to see how to convert a signal from Unidentified to Identified) or make a note in the wiki discussion page (in the signal page click the discussion tab at the top) or make a comment in the comments area on the Unidentified Signals Database main page. -2FSK?????? ?A3J?AFSKAudio Frequency-Shift KeyingAMAmplitude ModulationAMAmplitude Modulation OR USBUpper Side Band Modulation (Radio, referring to reception and modulation mode)Universal Serial Bus (Computer, referring to USB Ports and cables)BFMC4FMContinuous 4-Level Frequency ModulationCWContinuous Wave-LFFSKFast Frequency-Shift KeyingFMFrequency ModulationFMCWFMNFSKFrequency-Shift KeyingFSKFrequency-Shift Keying?Frequency Shift 15 kHzKiloHertz (kHz) 10^3 Hz approx 1 per secondGFSKGaussian Frequency-Shift KeyingGMSKGaussian Minimum-Shift KeyingILFMMFSKMultiple Frequency Shift-KeyingN/ANFMNarrowband Frequency ModulationNot KnownOOKOn-Off Keying ModulationP25PCM? AFSKAudio Frequency-Shift Keying?PPMPulse Position ModulationPSKPhase-Shift KeyingPossibly FSKFrequency-Shift Keying?PulseQAMQuadrature Amplitude ModulationQAMQuadrature Amplitude Modulation?UnkUnknownUnknown (Digital)pulseunknown¿? Relatively weak, visibly disperses over the ~2-4 miles driven during the waterfall recording. I Think this signal if for display hour of the Mistral-Nework (Network of buses for the town). Apologies for my poor english ! Best regards. Sonde type id while searching for sonde this came up used sonde monitor but didnt decode ? any idea what sonde type gives this waterfall pattern ? Unidentified Thing Submitted on behalf of Aaronata. Not sure what this was supposed to be. Unk Russian Intel 1 Sample from RadioScanner, supposed to be a variant of russian intel digimode testing, unsure of name/variant. Unk Russian Intel 3 Sample from RadioScanner, supposed to be a variant of russian intel digimode testing, unsure of name/variant. Possibly poor recording quality, unique preamble intro. Considerable high frequency losses in recording. Unk Russian Intel or Military ofdm Sample from RadioScanner, supposed to be a variant of russian intel digimode, unsure of name/variant. Recorded by Karapuz supposedly. Unk Russian Intel or Military СТРYНА OFDM Sample from RadioScanner, supposed to be a variant of russian intel or military digimode testing, unsure of name/variant. Possibly recorded by KarapuZ, not sure where I got from. Unknown 172.212 this signal was picked-up in the south of France neer Spain. i was at ~50 km from Mediterranean sea and approximately the same distance from the Canigou mountain. Unknown 40 3 Sounds like a ringing phone. 40.672 MHzMegaHertz (MHz) 10^6 Hz NFMNarrowband Frequency Modulation 0 HzHertz (Hz), unit of frequency, defined as one cycle per second (1 Hz). 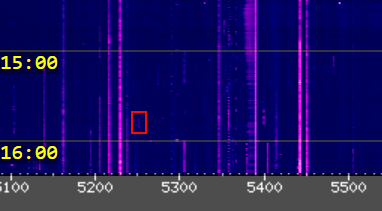 Unknown 434p450 Maybe FSKFrequency-Shift Keying modulation ? The transmission is continuous for at least 6-8mn but is not all time continuous (no burst). Unknown 648 Frequency shifting. Received in New London County. 648.01 MHzMegaHertz (MHz) 10^6 Hz CWContinuous Wave 300 HzHertz (Hz), unit of frequency, defined as one cycle per second (1 Hz). Unkown Periodic Signal Unknown periodic signal around 94.5 kHzKiloHertz (kHz) 10^3 Hz 0 HzHertz (Hz), unit of frequency, defined as one cycle per second (1 Hz). Unknown Unknown 0 HzHertz (Hz), unit of frequency, defined as one cycle per second (1 Hz). Thanks for the ids! I'm a little busy currently but i'll incorporate your changes into the signals as soon as I get a chance! Thanks, I commented on them. 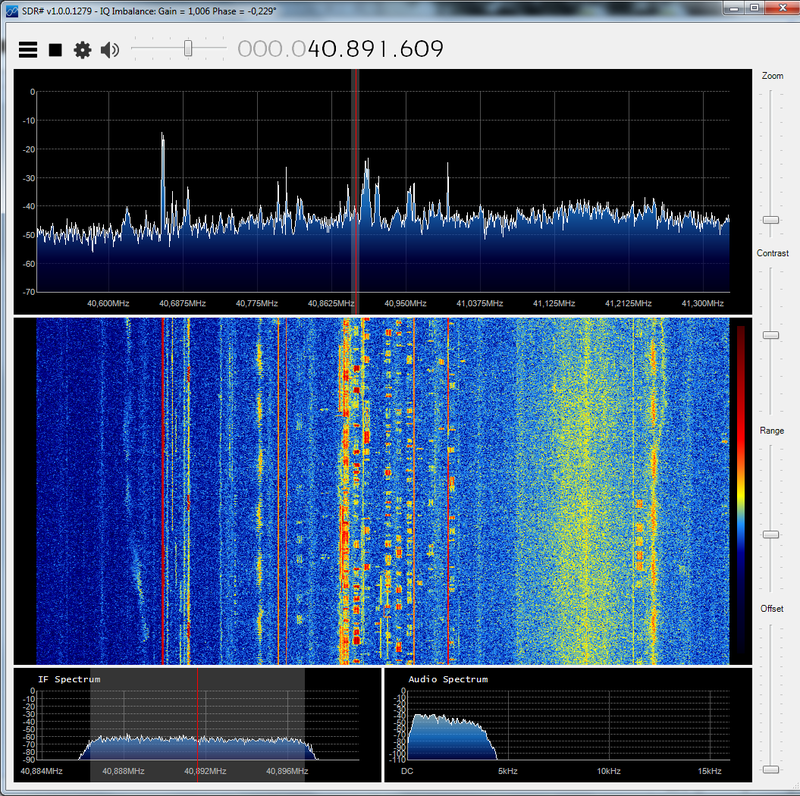 Moved unid psk signal narrowband into signal page as Australian Military ISBIndependent Side Band Modulation Modem. "Anyone can edit a signal page by clicking the "edit with form" at the top of the page." What was the issue? There's two ways one can edit a page. One is using the form. The other is by using edit. If you can explain the specific issue you faced when trying to edit the page, we can fix the issue. Yes please explain the issue so we can fix it. Everything appears to be working fine at the moment on my end. Or are you trying to click the edit button on the main page? You need to click edit on a signal page to edit it. I dont have anything that would be useful for that one :/. It could be some packet-switched pager, or telemetry. Might even be one of those suggested signals, but I'm just guessing. Probably FSKFrequency-Shift Keying based. When I originally posted this one, I checked on the FCC's license search, and both frequencies are assigned to water towers near my area, so I'm guessing the data has something to do specifically with that. UNID Telemetry http://www.s...ID_Telemetry - minimodem consistently decodes some of this to plaintext ASCII (minimodem --rx 1200). 0:20 looks like some sort of periodic TXTransmit test (12345qrstuvwxyz). It doesn't sound exactly like the standard tones used in, e.g., APRSAutomatic Packet Reporting System, an amateur radio-based system for real time tactical digital communications of information of immediate value in the local area though, so I'm sure some settings could be tweaked a bit. interesting, how did you decode the FSKFrequency-Shift Keying? some sort of generalized FSKFrequency-Shift Keying decoder? Unknown 409 bears a strong resemblance to MPT1317. It uses exactly the same modulation and coding as MPT1327 except that multiple base stations share the same frequency hence the stopping and starting of the data bursts at regular intervals at different signal strengths. I will definitely look into this, thanks for your observations! I looked into it and it doesnt seem to be similar enough, unknown 409 looks to have a PSKPhase-Shift Keying modulation thing going on, but it doesnt seem to be MPT. Yes - there's a great little piece of software called minimodem (lives at http://www.w...m/minimodem/). It allows you to "receive" or "transmit" AFSKAudio Frequency-Shift Keying at any arbitrary bitrate via your soundcard. You can fiddle with all sorts of settings like mark and space tone values, start and stop bits, and a bunch more- pretty neat. I *think* Unknown Sinal 280 (http://www.s...wn_Sinal_280) is iDEN (http://www.s...twork_(iDEN) ). I see the same spectrum and hear the same sound (sounds virtually the same as the background noise) on 770-something MHzMegaHertz (MHz) 10^6 Hz; occupies the same amount of spectrum, about 18-19kHz. I posted Unknown FSKFrequency-Shift Keying Blips (http://www.s...wn_FSK_Blips) a long time ago. I think these are just some sort of idling signal sent by mobile units, as sometimes the air breaks and a National Grid tech will be talking on it. @Avsa242: Thanks! I'll definitely play around with minimodem. I long suspected Unknown Sinal 280 to be IDEN but i just never saw my local iDEN have those bursts like that. I'm 90% certain though that it is iDEN of some sort. The idling sequence for some radios are pretty interesting. I haven't seen a FSKFrequency-Shift Keying-based idle before. These continued bursts are definitely characteristic of an idling radio maintaining channel presence for other radios to know if they're in range and available to take a call. It would be very hard to make an article on 'idling radios' since they all seem to have their own format. the digital radios like P25 have their own, so do DMR and MotoTRBO. Analog just keys on in bursts. Unknown MPT1327-Like signal appears compound modulated, i.e. FMFrequency Modulation or AMAmplitude Modulation. I will try and download it and look at it later. I suspect an underlying BB containing a V-series modem. Unknown 16p4732 PSKPhase-Shift Keying Serial is a STANAGNATO Standardization Agreement (STANAG), defines processes, procedures, terms, and conditions for common military or technical procedures or equipment between the member countries of the North Atlantic Treaty Organization (NATO).-4285. ACFAutoCorrelation Function 106.66mS and waterfall fit fine. The 27Mhz Happy New Year and Human Voice is no doubt 11 meter illegal CB radio operators doing their usual. I agree, definately looks like it. Do you happen to have an IQ recording or audio sample of it? The frequency sweep intro and end look interesting, none of the POCSAG's near me have that. I'll take a look into this and transfer Unknown Pear to identified Signals soon. Thanks! The 160m one is stanag. I verified the baudBaud (unit symbol Bd) is the unit for symbol rate or modulation rate in symbols per second. rate and it is 2400, the same as stanag. It doesn't do well on the phase plot though, but thats because of severe multipath interference. Thanks! 7p585 is most likely an OTHOver The Horizon (very long range) radar or something used for research of oceans/ionosphere, agree? Correct me if I'm wrong. Yes, it is definitely a type of radar. As to what specific one it falls under is still a mystery. A possible candidate given the waterfall is http://www.s...twork_(JORN). But I have seen other unidentified signals with that tone in front. See now what I dont understand is why wouldnt they be able to create Minimodem for windows.....? I want minimodem!! FOR MY OS!! Hey has anyone ever gotten around to solving my 464.75 MHzMegaHertz (MHz) 10^6 Hz pulsing with the rhythmatic bursts? Signal Repeated tone is a type of SCADA telemetry associated with utilities usually water treatment plants. It used to be country wide unntil most adopted other digital methods. unknown trunking or data signal is a type of SCADA associated with substations. The constant data bursts are updates on the status of the substation. Please add that to the 'SCADA' section of this wiki. where can i hand in some screenshots of a signal? Not a few of these mysterious 'transmissions' are caused by interference from the user's own domestic appliances, starting with computer CPU, PSU, monitor etc. These devices produce harmonics ('birdies') which seem like carriers; they also radiate pulses that appear to be signals. One of the noises here is a cell-phone charger! Solar-power roof-top systems are incredibly noisy! Electrical appliances are by law not allowed to interfere with TV or radio broadcasts, but they can be heard on other parts of the spectrum. A lot of commercial two-way VHFVery High Frequency (30-300 MHz)/UHFUltra High Frequency (300-3000 MHz) radio is trunked and digitally encrypted, and so it seems exciting, but is just routine messaging. And ham radio conversation is often pretty dull. Trust me... I'm a ham. It's 'ham'. Not 'HAM'. The letters do not stand for anything. This page was last modified on 5 March 2018, at 16:08.